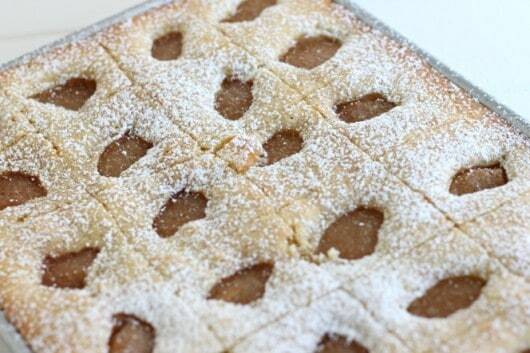 just wait until you get a taste of these apple squares. 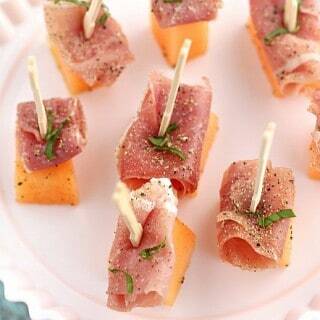 This is the type of recipe that will be requested over and over. It’s very easy to make, and looks CUTE too! It transports well which is an added bonus. Everyone will think you spent a TON of time on this, but they will be mistaken. 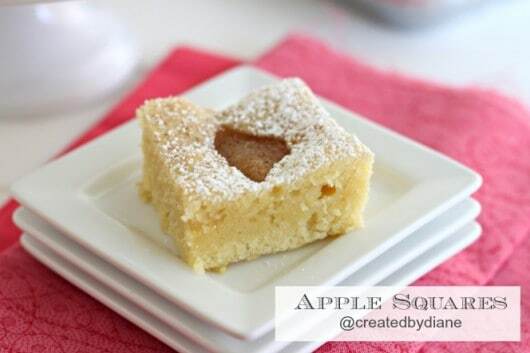 Mix up the batter, spread it in the pan, then take a knife and score the batter so you have created square shapes in the pan. 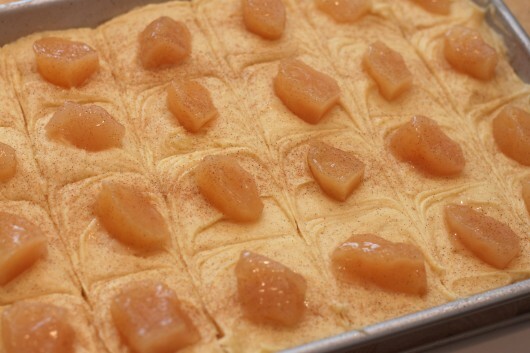 As the batter bakes, it puffs up around the apples creating little pockets. 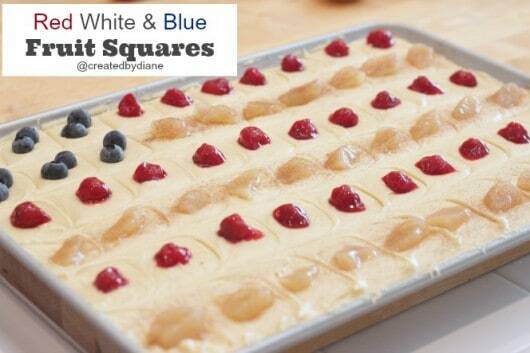 Once the tray has cooled, you can cut the squares and add powdered sugar. If you use unsalted butter you may want to add ¼ teaspoon salt to batter. 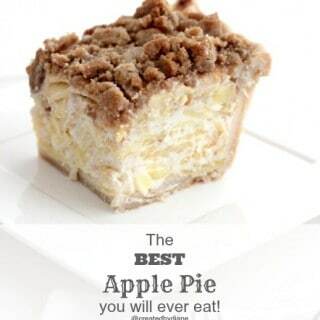 Add more cinnamon to the apples filling or to the batter if you like a stronger cinnamon flavor. I made these to look like a flag, it cake out really cute. Here is a photo before it was baked. Fresh blueberries, cherry pie filling and apple pie filling. 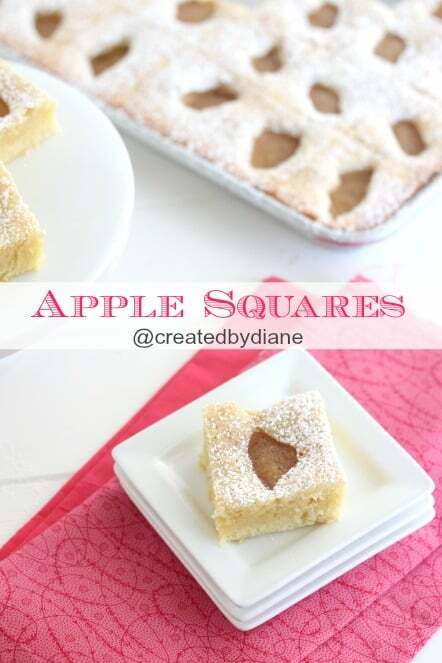 Cut apple squares into a square and serve. 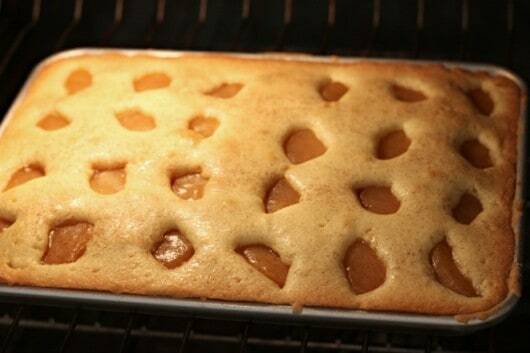 This cake slices up nice and it’s such a great alternative to serving apple pie, it’s wonderful for parties as you can transport it in the baking pan or slice them and arrange them on a platter and they won’t mess up in the car ride over, unlike many other desserts. It looks so moist too! Lovely! These make me crave Fall. 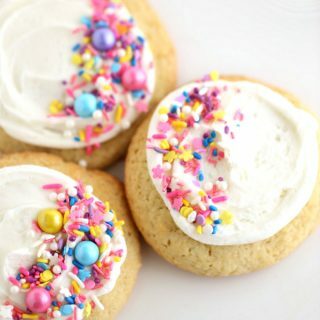 I think I can handle making these! I really like this idea, than you for sharing. I am curious, what was the rationale behind not having any rising agent in the recipe? The cake looks very dense. 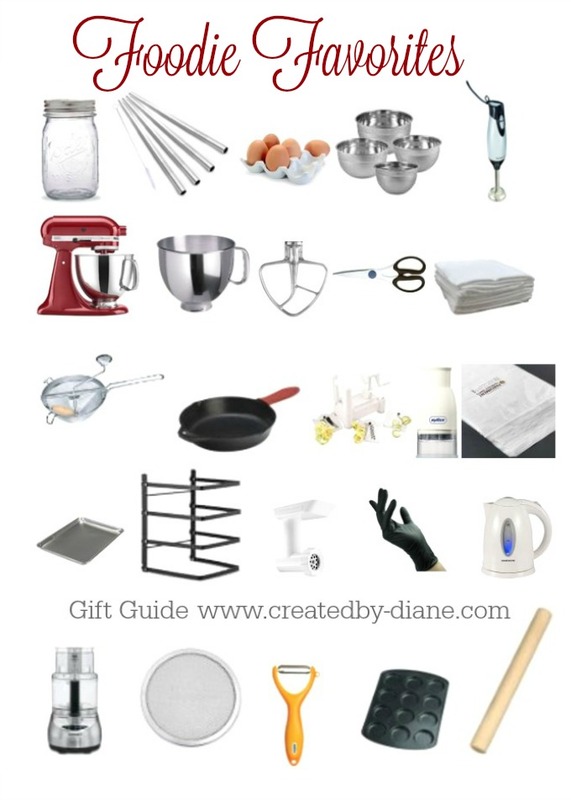 That works for me, I like dense cake as well but not everybody I serve does unfortunately, which made me curious about the lack of baking soda or powder. The levening in this recipe is the eggs. Yes it’s more sence than say a fluffy cake. It really is delicious paired with fruit, which is heavy. 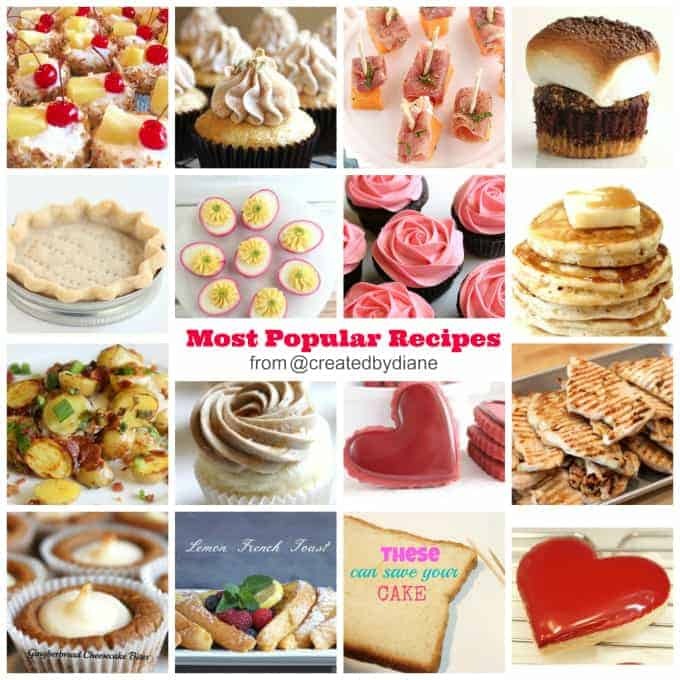 Hope you give it a try, it really is a crowd pleaser. Thank you – these look great! 2 questions – one, can you substitute oil for marg? And two – do these freeze well? Thanks!! There is no oil or margarine in this recipe. It calls for butter and I would only recommend using butter. 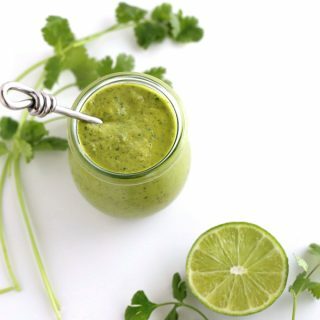 Yes, it makes a huge difference in the end result, the flavor and texture would not be the same if you substitute the ingredients I’ve listed. I’ve made this many times but have not frozen it. I’m sure you could freeze some leftovers if needed and thaw it out before consuming and it should be fine.